Children of Our Savior Preschool will be closed Monday, May 28th for Memorial Day. Come join us Thursday evenings at 6pm for FamJam , a child friendly worship service and picnic dinner! graduation form and payment by June 1st. Tuesday, May 29th we have a special guest chapel presenter: The Scripture Lady!! 9:30am, you don't want to miss this. 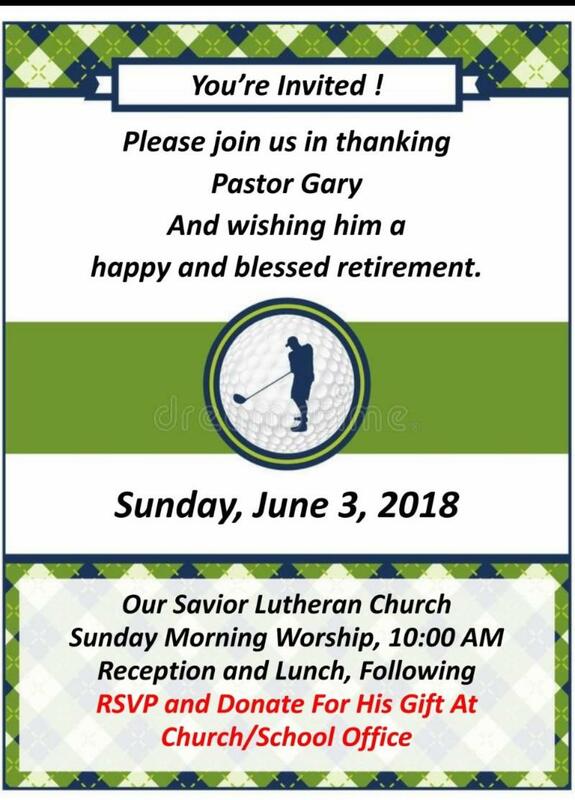 Sunday, June 3rd is Pastor Gary Boye's last Sunday with Our Savior Lutheran Church. Come join us in wishing him well!! Church service is at 10am, lunch to follow. See message and flyer below. Our last Chapel of the school year will be Tuesday, June 19th at 9:30am . We will have a special blessing for our students leaving COOS but not graduating. Our Dad's breakfast will be Friday, June 15th 7:30am-9am. We will have breakfast and other fun activities! Please RSVP in your classroom. Pre-K Graduation is Friday, June 29th . We are closed at 12pm this day to allow all the teachers to join in the graduation. Please pick up your children promptly. Sadly, Pastor Gary’s year with us is quickly coming to an end. Please join us in thanking him and wishing him a happy and blessed retirement. On Sunday, June 3, there will be a special worship service and luncheon following. We are also gathering donations to purchase gifts for both him and his wife. You may RSVP at the school office. Please see the flyer below.